Calendar of Treasury Papers, Volume 1, 1556-1696. Originally published by Her Majesty's Stationery Office, London, 1868. 1. 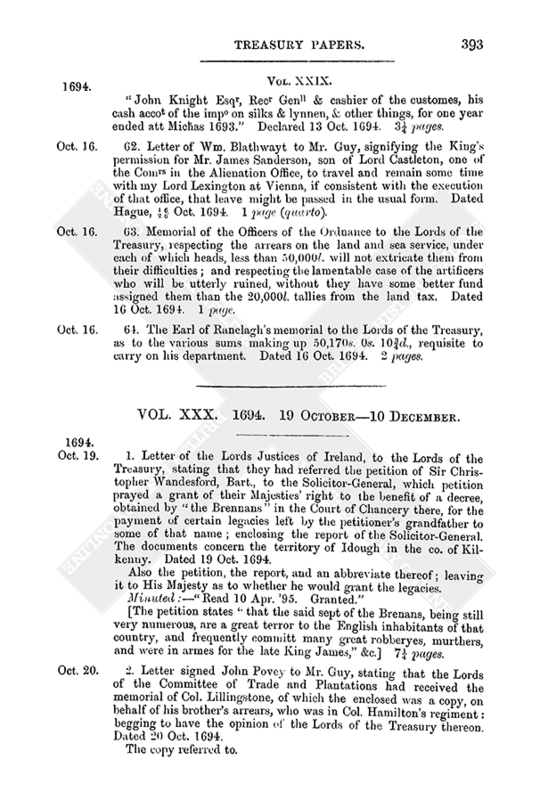 Letter of the Lords Justices of Ireland, to the Lords of the Treasury, stating that they had referred the petition of Sir Christopher Wandesford, Bart., to the Solicitor-General, which petition prayed a grant of their Majesties' right to the benefit of a decree, obtained by “the Brennans” in the Court of Chancery there, for the payment of certain legacies left by the petitioner's grandfather to some of that name; enclosing the report of the Solicitor-General. The documents concern the territory of Idough in the co. of Kilkenny. Dated 19 Oct. 1694. Also the petition, the report, and an abbreviate thereof; leaving it to His Majesty as to whether he would grant the legacies. [The petition states “that the said sept of the Brenans, being still very numerous, are a great terror to the English inhabitants of that country, and frequently committ many great robberyes, murthers, and were in armes for the late King James,” &c.] 7¼ pages. 2. Letter signed John Povey to Mr. Guy, stating that the Lords of the Committee of Trade and Plantations had received the memorial of Col. Lillingstone, of which the enclosed was a copy, on behalf of his brother's arrears, who was in Col. Hamilton's regiment: begging to have the opinion of the Lords of the Treasury thereon. Dated 20 Oct. 1694. Also a memorial of Col. Lillingston, in the same terms, to the Lords of the Treasury. Dated 5 Oct. 1694. 3 pages. 3. Letter by command of the Lords of the Committee of Trade and Plantations, enclosing copy of a memorial of Col. Lillingston to them, and desiring their Lordships to return their opinion on Col. Lillingston's former memorial, and further what money or letters of credit would be necessary to be sent with the forces for Jamaica. Dated 20 Oct. 1694. Accompanied by the copy, complaining to the Lords of the Committee, that the Lords of the Treasury had not ordered any money for making and providing new clothing for the regiment; nor any for his own equipage; so that if the ships had gone out of the river it might be impossible to send them by land, for there were no carts between Exeter and Plymouth. 2 pages. 4. Copy of Sir George Treby's opinion as to a lease of the manor of Mere, in the county of Wilts, parcel of the duchy of Cornwall. Given on the report hereafter described. Dated 20 Oct. 1694. Copy of report of Mr. Wm. Harbord, Surveyor-General, addressed to the Lords of the Treasury, on the petition of Sir Matthew Andrewes, for a renewal of the lease: finding that King Charles the Second, in A.D. 1660, granted to Robert Phillip, Esq., one of the gentlemen of the bedchamber for 30 years, certain rents amounting to 79l. 17s. 11d., which lease was assigned to the petitioner in 1665; that the demesnes, warren, and park were again granted in 1670, to Henry North, Esq., for 11 years, in reversion of Mr. Phillip's lease; in 1684 the surveyor had valued the term of 15 years at a fine of 1,000l., and there was charged on the premises for the support of the church above 40l. a year, the rent to the King being 45l. 10s., and 20l. a year more for other incidental charges; advising that a term of 19½ years from Lady Day 1701, might be granted, which might be valued at 1,500l., and further that certain woods might be granted to him, belonging to the manor; and as to the residue of the manor, which was included in Mr. Phillip's lease, it was valued in 1650 at 105l. per ann., and he thought 500l. a reasonable fine for the estate desired, the manor being parcel of the duchy of Cornwall could not be granted, but if the King pleased to grant a lease for 30 years and a half from Lady Day 1690, such a lease might be good during the King's life, and until there was a Duke of Cornwall. Dated 24 Aug. 1689. 3½ pages. 5. Report of the Comrs of Excise upon the annexed petition of Richard Kinch, distiller, who was in arrears 250l. for his excise duty, recommending that he should be allowed to pay his debt by instalments. Dated 20 Oct. 1694. Minuted:—“29th Oct. '94. Agreed to ye report.” 1½ pages. 6. The case of Wm. Yardley, under-housekeeper, wardrobe keeper and surveyor, and keeper of their Majesties' gardens and orchards in Greenwich. He prayed that he might have some employment in the hospital to be founded for sick and wounded seamen, in consideration of his loss by the building of the same. Dated 22 Oct. 1694. Minuted:—“To bee considered when officers of this kind are chosen.” 1 page. 7. Presentment by the Comrs of Transportation, to the Lords of the Treasury, as to freight, hammocks, bedding, &c. Dated 23 Oct. '94. 1½ pages. 8. Memorial of the Officers of the Ordnance to the Lords of the Treasury. Docquetted:—“Concerning taking money for the gunsmiths, in the annuities, and a state of the debt of the office.” Dated 23 Oct. 1694. Accompanied by the state of the debt. 3 pages. 9. The Earl of Ranelagh's memorial to the Lords of the Treasury, as to the various sums making up 10,338l. 12s. 5d., requisite for payment of forces, &c. Dated 23 Oct. 1694. 2 pages. 10. An affidavit of William Ennis, Supervisor of the 6th Division in London, as to the charging of John Shorter, victualler at Clerkenwell, for beer and ale brewed by him. Dated 24 Oct. 1694. [? An enclosure.] 1½ pages. 11. Letter of Mr. John Povey to Mr. 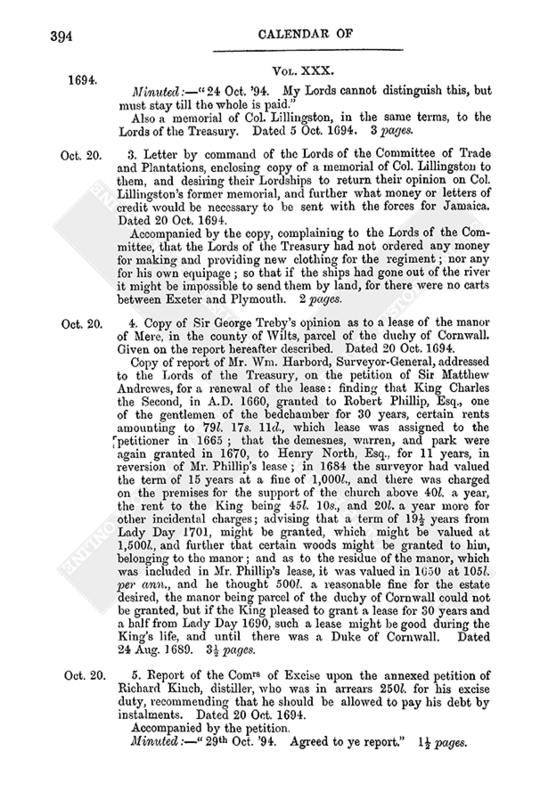 Guy, stating that the Committee of Trade and Plantations had appointed to meet at the Council Chamber at Whitehall on that day, when they expected to receive the opinion of their Lordships upon the estimate of medicines for the Jamaica forces, and upon the estimate of provisions for the sick soldiers. Dated 24 Oct. 1694. Docquetted:—“Mr Povey abt ye provisions for ye Jamaica expedition.” ½ page. 12. Copy of a letter of the Lords Justices of Ireland, to the Lords of the Treasury, stating that they had referred the petition of Mr. Alexander Higgins (which prayed that a debt of 400l. due from the late Earl of Tyrconnell might be satisfied from the Earl's forfeited estate) to Sir Richard Levinge, the Solicitor-General, transmitting his report thereon, in which he states that it is entirely a matter of favour, if their Majesties see fit to grant the prayer of the petition. Dated 24 Oct. 1694. Also the report. 3 pages and 2 halves. 13. 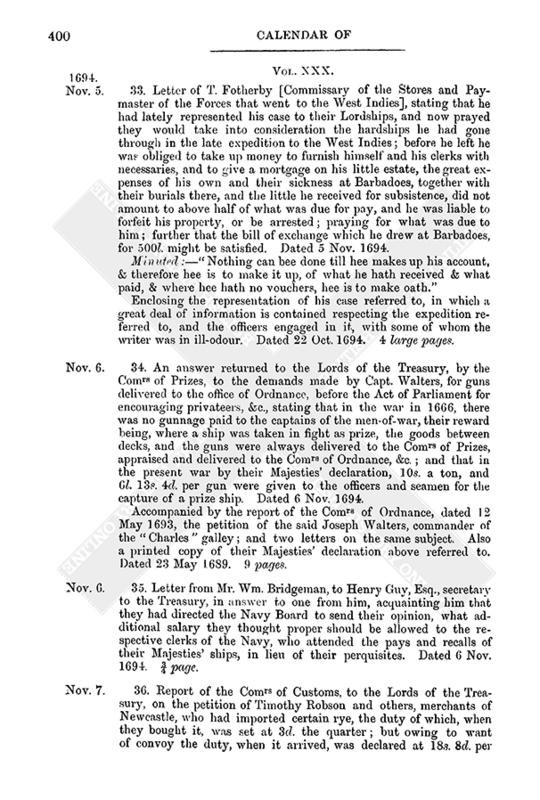 Report of the Comrs of Customs, to the Lords of the Treasury, “concerning Mr. Culliford's being employed as a general surveyor of Customs,” reminding their Lordships of the constant opinion of the Board against the establishing of an officer of that kind, and referring to other of their reports on the same subject, in which they laid before their Lordships the origin of the office, it being at first a constitution of three persons, under the character of Surveyor-General, with a salary of 1,000 marks per ann. each, and 20s. a day travelling charges; the reasons why they were sunk and suppressed were that they were unnecessary and burthensome to the revenue. Out of the charge four land surveyors had been established. The Comrs saw no reason to depart from their previous opinions. They had agreed upon a method for a more thorough inspection of the out-ports. Dated 25 Oct. 1694. Enclosing copies of three reports on the same subject, dated 21 June and 22 Aug. 1689, and 23 Sept. 1691; and presentments dated 13 Oct. 1679, 9 Dec. 1679, and 14 March 1686–7. 9 pages or parts of pages. 14. 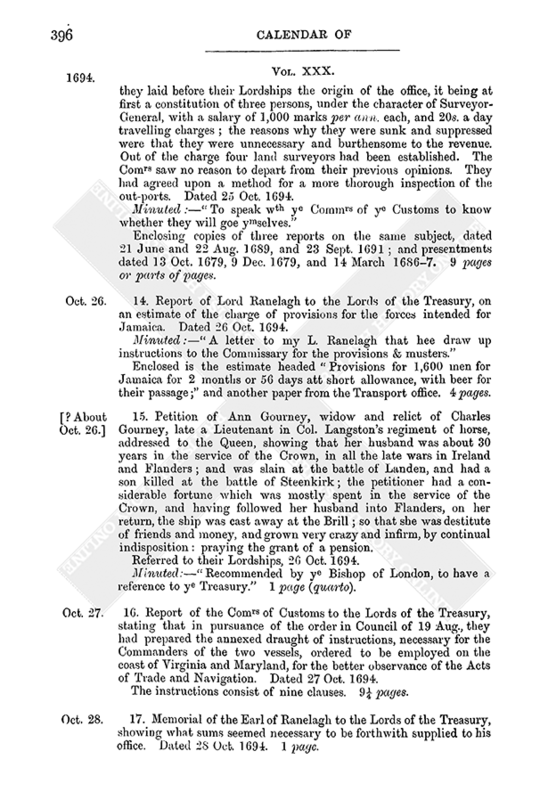 Report of Lord Ranelagh to the Lords of the Treasury, on an estimate of the charge of provisions for the forces intended for Jamaica. Dated 26 Oct. 1694. Enclosed is the estimate headed “Provisions for 1,600 men for Jamaica for 2 months or 56 days att short allowance, with beer for their passage;” and another paper from the Transport office. 4 pages. 15. Petition of Ann Gourney, widow and relict of Charles Gourney, late a Lieutenant in Col. Langston's regiment of horse, addressed to the Queen, showing that her husband was about 30 years in the service of the Crown, in all the late wars in Ireland and Flanders; and was slain at the battle of Landen, and had a son killed at the battle of Steenkirk; the petitioner had a considerable fortune which was mostly spent in the service of the Crown, and having followed her husband into Flanders, on her return, the ship was cast away at the Brill; so that she was destitute of friends and money, and grown very crazy and infirm, by continual indisposition: praying the grant of a pension. Referred to their Lordships, 26 Oct. 1694. Minuted:—“Recommended by ye Bishop of London, to have a reference to ye Treasury.” 1 page (quarto). 16. Report of the Comrs of Customs to the Lords of the Treasury, stating that in pursuance of the order in Council of 19 Aug., they had prepared the annexed draught of instructions, necessary for the Commanders of the two vessels, ordered to be employed on the coast of Virginia and Maryland, for the better observance of the Acts of Trade and Navigation. Dated 27 Oct. 1694. The instructions consist of nine clauses. 9¼ pages. 17. Memorial of the Earl of Ranelagh to the Lords of the Treasury, showing what sums seemed necessary to be forthwith supplied to his office. Dated 28 Oct. 1694. 1 page. 18. 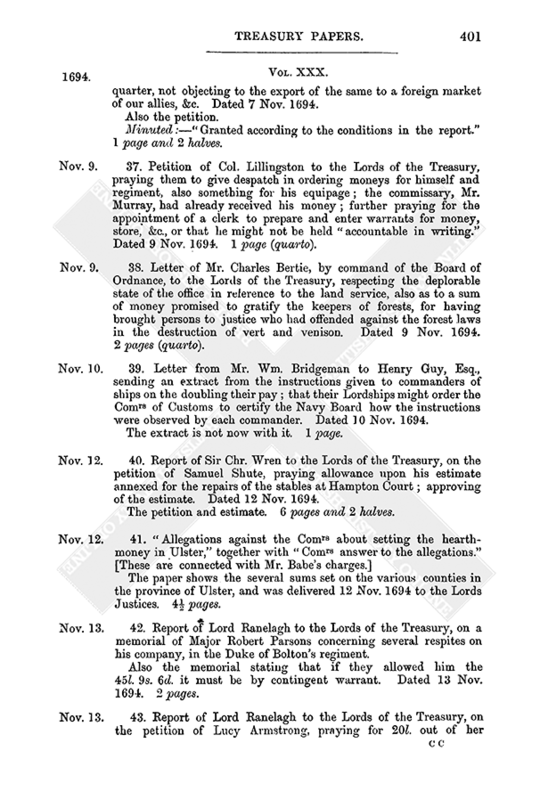 Report signed “Charles Twitty” to the Lords of the Treasury, on the petition of Thomas Shirley and Benjamin Gregg, Esqrs., sergeants-at-arms to their Majesties; on the arrears of pay due to them. Minuted:—“29th Oct. '94. To have tallys as ye rest have had.” 1 page. 19. Petition of the officers of the Royal regiment of horse, under the command of the Earl of Oxford, showing that they had received in tallies 5000l., being part of their arrears, which they were forced to dispose of at 25l. and 30l. per cent. loss; also that they had an assurance that they should have the remainder in ready money, which they expected long before this; praying for payment of the arrears. Minuted:—“29th Oct. '94. My Lords are not at liberty to take consideration of the Irish arreares at this time.” 1 page. 20. Petition of William Woollaston and George Fry, sutlers to their Majesties' horse guards; praying that 1,100l. or thereabouts, due to them for provisions supplied to the regiment of horse, under the command of the Earl of Oxford, might be stopped in the hands of the Right Hon. the Earl of Ranelagh and paid to them, and not paid to the officers; in regard that some of them do so long keep them out of their money. Minuted:—“29th Oct. '94. Referr'd to my Ld Ranelagh.” 1 page. 21. Memorial of the officers of the Ordnance, to the Lords of the Treasury; stating that though their Lordships had given them the arrears for sea-service, yet they could not carry on the business of the office, until the arrears for land-service were allowed, and otherwise detailing their difficulties; and further stating that there was about 1,400l. due on Mr. Bomhover's account, for arms bought in Holland, which they hoped their Lordships would order: and reminding them, that they omitted 500l. in the last week's distribution for the new powder house. Dated 30 Oct. 1694. 2 pages. “Mr. Roberts & other Comrs of the Irish Revenue are cald in and informe my Lords that Mr. Babe has exhibited a complaint against some of the sd Irish Comrs before the Comrs of Accots. These Comrs are to be here again on Munda morning.” 1 page. 23. A schedule of such sums as the Earl of Ranelagh desired their Lordships to supply, amounting to 584l. 16s. Dated 31 Oct. 1694. 1 page (quarto). 24. Report of the Comrs of Customs to the Lords of the Treasury, on the memorial of Col. Richard Filden, desiring liberty to export a bell, not exceeding 4 cwt., to Barbadoes, for a parish church there, he praying the customs thereon. It was contrary to certain statutes, but their Lordships had permitted it in particular cases. Dated 31 Oct. 1694. Accompained by the petition. 1¼ pages. 25. Memorial of Col. Lillingston to the Lords of the Treasury, stating that he had viewed the shoes and stockings in the stores, and neither of them were fit for use; the stockings were too thin, and the shoes had been made two years, and if delivered out for Jamaica must burst, as most of those did, which were delivered out in Ireland; asking that their Lordships would order him 1,200l. to buy shoes, shirts, &c., that they would order some one to survey the remains of the last West India clothing, furnished by Messrs. Richmond and Cordwent, &c.: since Mr. Fotherby could not settle the account of provisions, during the last expedition, and the soldiers arrears could not be paid, the Colonel prayed for a settlement of the arrears of the officers; and that as much more might be ordered, as was paid to the regiment of Col. Colt., viz., 30l. a week, amounting to near 700l. ; further that their Lordships would order the contingent money to the regiment. Docquetted:—“Brought by Coll. Lillingston, October 31, 1694.” 2 pages. 26. The state of the case of Wm. Smith, lessee of Hanbury Park, &c., represented to the Lords of the Treasury. Docquetted:—“Mr Smith's answer to Mr Guy's letter of the 29th of Septr 1694, touching felling wood at Hanbury Parke.” The park was parcel of the honor of Tutbury, in the county of Stafford, which was parcel of the duchy of Lancaster, and was held by the same Smith by assignments from Sir Thomas Morgan, Baronet, and Edward Vernon, Esq., deceased; and the lessee was charged with committing waste in the forest of Needwood, by cutting trees. Without date, but probably soon after the letter. One large page. 27. Letter by command of the Committee of Trade aud Plantations to the Lords of the Treasury, sending copy of a memorial of Col. Lillingston, concerning the method of paying his regiment in the West Indies, and another from Col. Northcott, relating to the necessary preparations for his regiment to go to Jamaica, for their Lordships' opinion. Dated 1 Nov. 1694. The latter is not now with it. A page and a half. 28. Report of Sir Edw. Ward, Attorney General, to the Lords of the Treasury, on the petition of Sir Edwin Steed, who was Governor of the island of Barbadoes, Judge of the Court of Admiralty, and Receiver-General of the Casual Revenues of the Crown, in the island several years; against whom Thomas Offley, Esq., (who had a grant from their Majesties to sue and recover their tenths of silver, plate, goods, &c., taken from Spanish wrecks, out of the sea in America, receiving one moiety himself and answering for the other moiety to their Majesties) had exhibited an information, charging the petitioner with receiving great sums from the wrecks, &c.: recommending the stay of proceedings. Dated 2 Nov. 1694. Also respecting two ships forfeited for trading to Guinea, contrary to the charter of the Afrícan Company. Dated 2 Nov. 1694. Four other papers and the petition. 6 pages. 29. 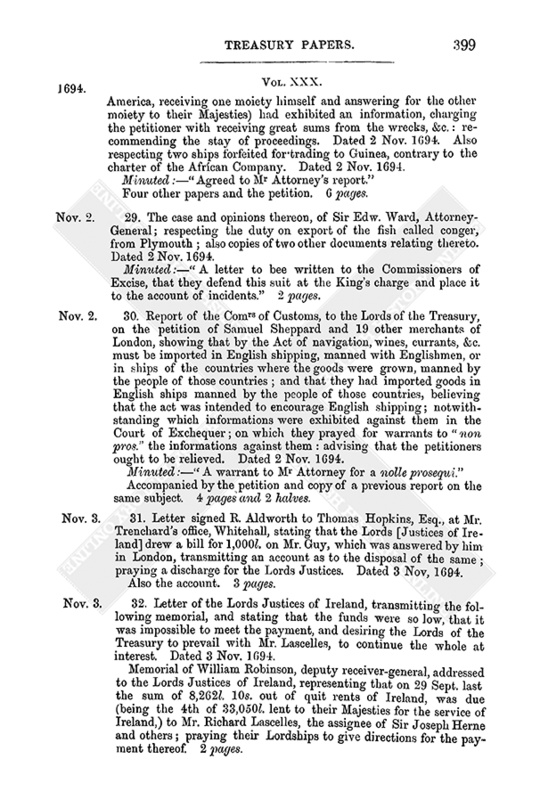 The case and opinions thereon, of Sir Edw. Ward, Attorney-General; respecting the duty on export of the fish called conger, from Plymouth; also copies of two other documents relating thereto. Dated 2 Nov. 1694. Minuted:—“A letter to bee written to the Commissioners of Excise, that they defend this suit at the King's charge and place it to the account of incidents.” 2 pages. 30. Report of the Comrs of Customs, to the Lords of the Treasury, on the petition of Samuel Sheppard and 19 other merchants of London, showing that by the Act of navigation, wines, currants, &c. must be imported in English shipping, manned with Englishmen, or in ships of the countries where the goods were grown, manned by the people of those countries; and that they had imported goods in English ships manned by the people of those countries, believing that the act was intended to encourage English shipping; notwithstanding which informations were exhibited against them in the Court of Exchequer; on which they prayed for warrants to “non pros.” the informations against them: advising that the petitioners ought to be relieved. Dated 2 Nov. 1694. Accompanied by the petition and copy of a previous report on the same subject. 4 pages and 2 halves. 31. Letter signed R. Aldworth to Thomas Hopkins, Esq., at Mr. Trenchard's office, Whitehall, stating that the Lords [Justices of Ireland] drew a bill for 1,000l. on Mr. Guy, which was answered by him in London, transmitting an account as to the disposal of the same; praying a discharge for the Lords Justices. Dated 3 Nov, 1694. Also the account. 3 pages. 32. 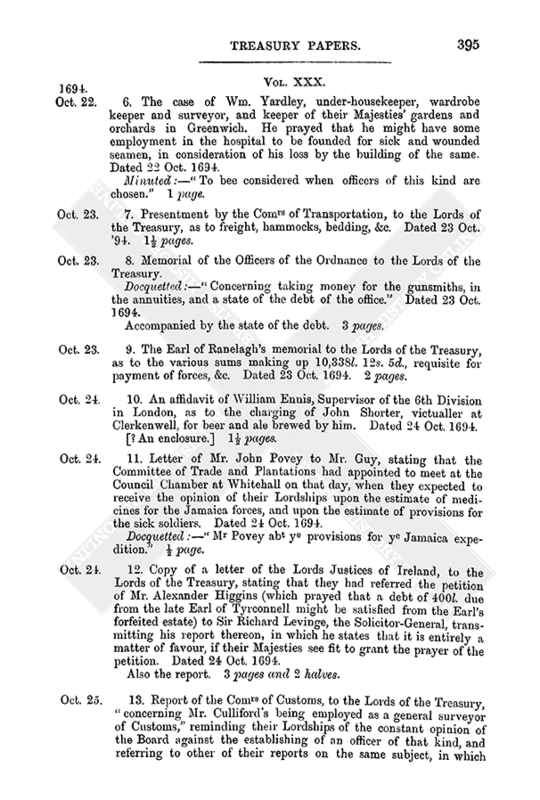 Letter of the Lords Justices of Ireland, transmitting the following memorial, and stating that the funds were so low, that it was impossible to meet the payment, and desiring the Lords of the Treasury to prevail with Mr. Lascelles, to continue the whole at interest. Dated 3 Nov. 1694. Memorial of William Robinson, deputy receiver-general, addressed to the Lords Justices of Ireland, representing that on 29 Sept. last the sum of 8,262l. 10s. out of quit rents of Ireland, was due (being the 4th of 33,050l. lent to their Majesties for the service of Ireland,) to Mr. Richard Lascelles, the assignee of Sir Joseph Herne and others; praying their Lordships to give directions for the payment thereof. 2 pages. 33. Letter of T. Fotherby [Commissary of the Stores and Paymaster of the Forces that went to the West Indies], stating that he had lately represented his case to their Lordships, and now prayed they would take into consideration the hardships he had gone through in the late expedition to the West Indies; before he left he was obliged to take up money to furnish himself and his clerks with necessaries, and to give a mortgage on his little estate, the great expenses of his own and their sickness at Barbadoes, together with their burials there, and the little he received for subsistence, did not amount to above half of what was due for pay, and he was liable to forfeit his property, or be arrested; praying for what was due to him; further that the bill of exchange which he drew at Barbadoes, for 500l. might be satisfied. Dated 5 Nov. 1694. Enclosing the representation of his case referred to, in which a great deal of information is contained respecting the expedition referred to, and the officers engaged in it, with some of whom the winter was in ill-odour. Dated 22 Oct. 1694. 4 large pages. 34. An answer returned to the Lords of the Treasury, by the Comrs of Prizes, to the demands made by Capt. Walters, for guns delivered to the office of Ordnance, before the Act of Parliament for encouraging privateers, &c., stating that in the war in 1666, there was no gunnage paid to the captains of the men-of-war, their reward being, where a ship was taken in fight as prize, the goods between decks, and the guns were always delivered to the Comrs of Prizes, appraised and delivered to the Comrs of Ordnance, &c.; and that in the present war by their Majesties' declaration, 10s. a ton, and 6l. 13s. 4d. per gun were given to the officers and seamen for the capture of a prize ship. Dated 6 Nov. 1694. Accompanied by the report of the Comrs of Ordnance, dated 12 May 1693, the petition of the said Joseph Walters, commander of the “Charles” galley; and two letters on the same subject. Also a printed copy of their Majesties' declaration above referred to. Dated 23 May 1689. 9 pages. 35. Letter from Mr. Wm. Bridgeman, to Henry Guy, Esq., secretary to the Treasury, in answer to one from him, acquainting him that they had directed the Navy Board to send their opinion, what additional salary they thought proper should be allowed to the respective clerks of the Navy, who attended the pays and recalls of their Majesties' ships, in lieu of their perquisites. Dated 6 Nov. 1694. ¾ page. 36. Report of the Comrs of Customs, to the Lords of the Treasury, on the petition of Timothy Robson and others, merchants of Newcastle, who had imported certain rye, the duty of which, when they bought it, was set at 3d. the quarter; but owing to want of convoy the duty, when it arrived, was declared at 18s. 8d. per quarter, not objecting to the export of the same to a foreign market of our allies, &c. Dated 7 Nov. 1694. Minuted:—“Granted according to the conditions in the report.” 1 page and 2 halves. 37. Petition of Col. Lillingston to the Lords of the Treasury, praying them to give despatch in ordering moneys for himself and regiment, also something for his equipage; the commissary, Mr. Murray, had already received his money; further praying for the appointment of a clerk to prepare and enter warrants for money, store, &c., or that he might not be held “accountable in writing.” Dated 9 Nov. 1694. 1 page (quarto). 38. Letter of Mr. Charles Bertie, by command of the Board of Ordnance, to the Lords of the Treasury, respecting the deplorable state of the office in reference to the land service, also as to a sum of money promised to gratify the keepers of forests, for having brought persons to justice who had offended against the forest laws in the destruction of vert and venison. Dated 9 Nov. 1694. 2 pages (quarto). 39. Letter from Mr. Wm. Bridgeman to Henry Guy, Esq., sending an extract from the instructions given to commanders of ships on the doubling their pay; that their Lordships might order the Comrs of Customs to certify the Navy Board how the instructions were observed by each commander. Dated 10 Nov. 1694. The extract is not now with it. 1 page. 40. Report of Sir Chr. Wren to the Lords of the Treasury, on the petition of Samuel Shute, praying allowance upon his estimate annexed for the repairs of the stables at Hampton Court; approving of the estimate. Dated 12 Nov. 1694. The petition and estimate. 6 pages and 2 halves. The paper shows the several sums set on the various counties in the province of Ulster, and was delivered 12 Nov. 1694 to the Lords Justices. 4½ pages. 42. 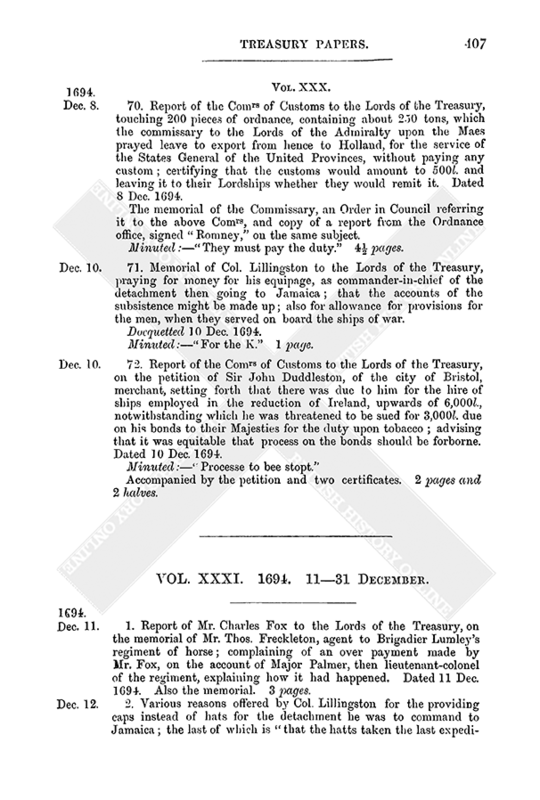 Report of Lord Ranelagh to the Lords of the Treasury, on a memorial of Major Robert Parsons concerning several respites on his company, in the Duke of Bolton's regiment. Also the memorial stating that if they allowed him the 45l. 9s. 6d. it must be by contingent warrant. Dated 13 Nov. 1694. 2 pages. 43. 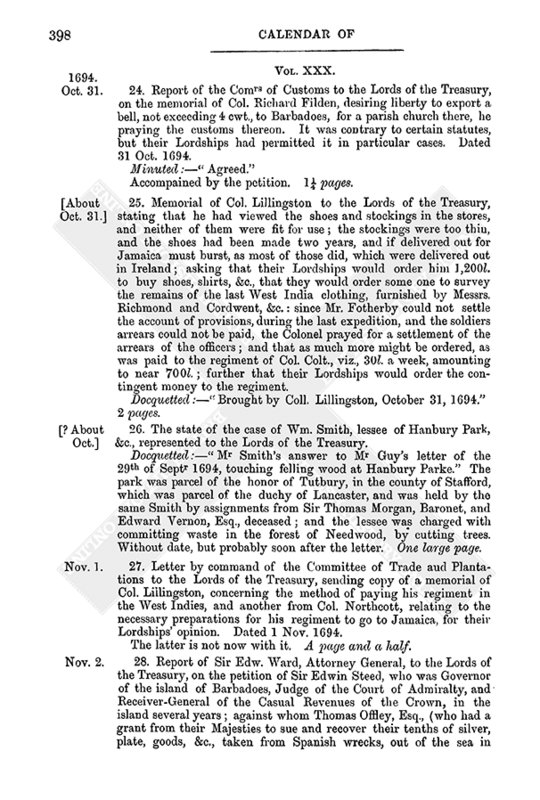 Report of Lord Ranelagh to the Lords of the Treasury, on the petition of Lucy Armstrong, praying for 20l. out of her husband's clearings as captain in Sir James Lesly's regiment, and 10s. a week for her support out of his subsistence. Dated 13 Nov. 1694. There is also a copy of this report, which was read 15 Sept. 1697, and a letter of the petitioner read on the same day, which is minuted “My Lords cannot doe this.” 2 pages and 2 halves. 44. Francis Babe's answer to the petition of the Comrs of Revenue [in Ireland], addressed to the Lords Justices there, denying that he charged the Comrs in general with conniving at a secret trade with France, or that he charged them therewith in his paper, entitled, “A View of the Usefulness of a Surveyor-general of the Revenue;” except Mr. Carleton, who might probably have connived at it, and carried on such a correspondence unknown to the other gentlemen of the Commission; explaining other parts of the paper, and seeking a full hearing of the matters. Dated 14 Nov. 1694. 1 page. 45. Letter of Mr. John Povey to Henry Guy, Esq., stating that he had prepared and enclosed the draughts of the two letters to be sent from their Lordships to the Governors of Virginia and Maryland, directing them to cause small vessels with skilful commanders to be hired, to cruise upon the coasts of those colonies and Pennsylvania; to prevent illegal trade. Dated 14 Nov. 1694. [The letters are not now with the above.] 1 page. 46. Letter from Lord Lucas to the Lords of the Treasury, desiring they would order some money for the prisoners in the Tower, adding that now they were close they were not able to help themselves, and he could not help them any longer. Dated 15 Nov. 1694. (2.) The account of moneys due to the Earl of Clancarty and Colonel MacElligott; with a certificate at the foot, by the Earl of Ranelagh, that the sums in the account are not provided for in the establishment. (3.) “The account of money due for diett and lodging for Colonel Dorrington, since his imprisonment in the Tower of London.” 5 pages, or parts of a pages. 47. Copy of depositions of Thos. Tench, in respect to the administration of the estate of his Excellency Lionel Copley, Esq., Governor of the province of Maryland. Dated 16 Nov. 1694. 3 pages. 48. 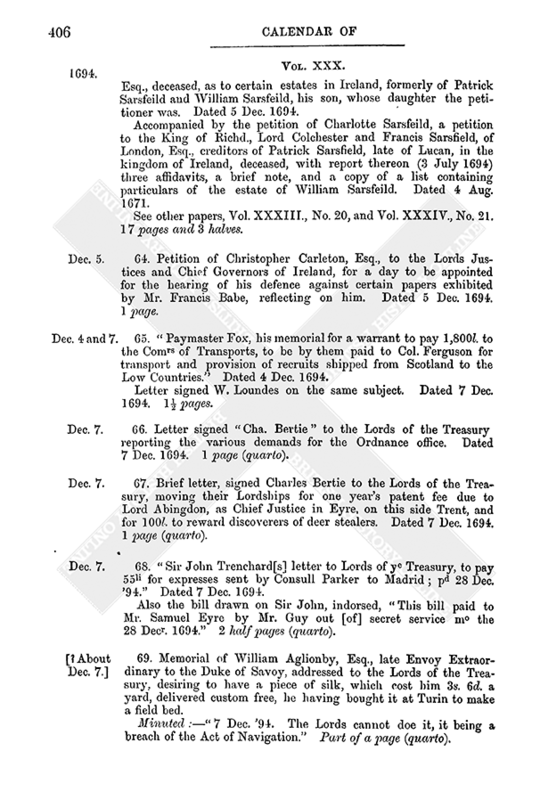 Presentment of the Comrs of Transportation to the Lords of the Treasury, as to a charge by Sir Richard Atkins, colonel of a regiment of foot then lately transported to Ireland, made against Alderman Tyrer of Liverpool, for having omitted to supply the provisions for the regiment; entirely exculpating him. Dated 17 Nov. 1694. Copies of divers other letters, &c. delivered to disprove the charge. 5 pages and 3 parts of pages. 49. Memorial of Richard Gibson, appointed by their Lordships to attend paying the recalls, addressed to the Lords of the Treasury, praying (1), that their Lordships would order the Comrs of the Navy to inspect the delivery of tickets, after examination at the ticket office, and a weekly list thereof to be sent to the memorialist: (2), asking if the enclosed advertisement should be published: (3), for allowance of a clerk to attend the recalls, and a messenger: and (4), praying for an order to the Navy Board to deliver to him blank sheets for pay-books, and other stationery. Accompanied by the copy of the advertisement. Dated 21 Nov. 1694. The following is in the Minute Book, vol. 6, p. 42, 7 June 1695:—“A warrt to be p[re]pared for Mr. Gibson to inquire of frauds in paymt of Tickets, & send it to ye Admlty, wth intimac[i]on that my Lords will signe it if they have no objection.” 1½ pages. 50. Memorial of the Comrs of Customs of Ireland, answering very fully and lucidly in detail a paper written by Mr. Francis Babe, entitled, “A View of the Usefulness of a Surveyor-general,” &c., stating generally that they found their whole Commission very scandalously and untruly reflected on. Dated 21 Nov. 1694. 6 pages. 51. Letter from Mr. Wm. 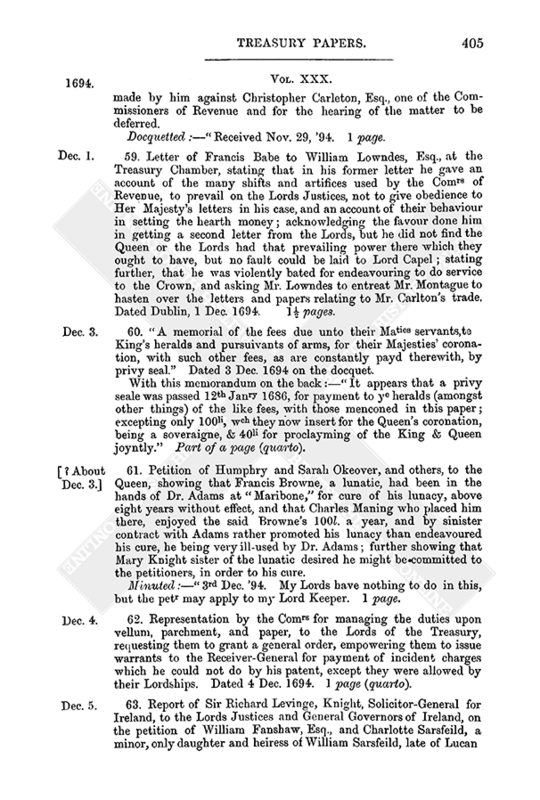 Bridgeman to Henry Guy, Esq., stating that the estimates given by the Lords of the Admiralty last night to the King, were not so perfect as they would have been if there had been more time, their Lordships desired their return, and sent certain papers in their stead. Dated 22 Nov. '94 ½ page. 52. Report of Mr. Charles Fox to the Lords of the Treasury, on the petition of Sir John Edgworth, as to the hardship of having certain men respited on the muster in 1689; in favour of his claim which amounted to 715l. Dated 23 Nov. 1694. Accompanied by the state of the petitioner's case and a report by Lord Ranelagh on the same; which is minuted, “Read 3 July, '95. My Lords do not find this to be an Irish arrear,” &c. 3 pages. 53. Office of Ordnance. Two letters of the officers of Ordnance and two estimates to be laid before Parliament for sea-service, showing the charge of fitting out vessels of different rates, &c.
Also “an Estimate of the charge of fitting-out a mortar-piece of 13 inches, &c., and 26 at the same rate.” Dated 19, 23 and 24 Nov. 1694. 8 pages. 54. Letter of William Blathwayt to Mr. 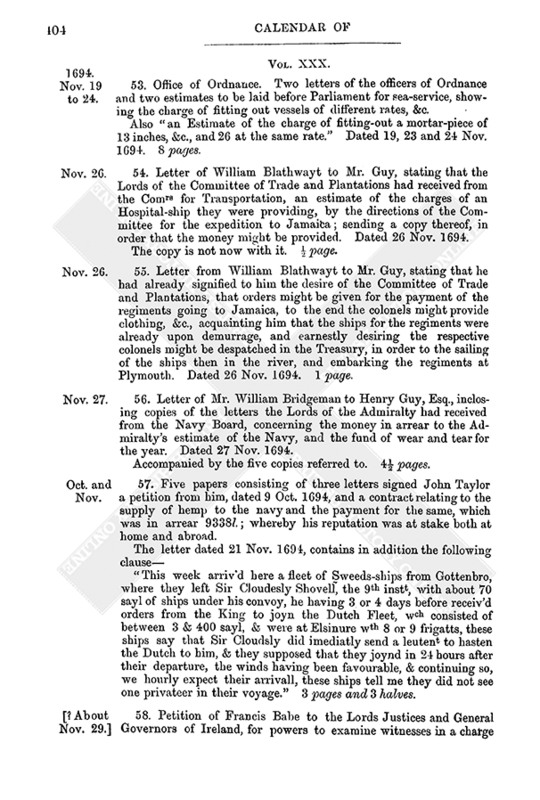 Guy, stating that the Lords of the Committee of Trade and Plantations had received from the Comrs for Transportation, an estimate of the charges of an Hospital-ship they were providing, by the directions of the Committee for the expedition to Jamaica; sending a copy thereof, in order that the money might be provided. Dated 26 Nov. 1694. The copy is not now with it. ½ page. 55. Letter from William Blathwayt to Mr. Guy, stating that he had already signified to him the desire of the Committee of Trade and Plantations, that orders might be given for the payment of the regiments going to Jamaica, to the end the colonels might provide clothing, &c., acquainting him that the ships for the regiments were already upon demurrage, and earnestly desiring the respective colonels might be despatched in the Treasury, in order to the sailing of the ships then in the river, and embarking the regiments at Plymouth. Dated 26 Nov. 1694. 1 page. 56. Letter of Mr. William Bridgeman to Henry Guy, Esq., inclosing copies of the letters the Lords of the Admiralty had received from the Navy Board, concerning the money in arrear to the Admiralty's estimate of the Navy, and the fund of wear and tear for the year. Dated 27 Nov. 1694. Accompanied by the five copies referred to. 4½ pages. 57. Five papers consisting of three letters signed John Taylor a petition from him, dated 9 Oct. 1694, and a contract relating to the supply of hemp to the navy and the payment for the same, which was in arrear 9338l. ; whereby his reputation was at stake both at home and abroad. “This week arriv'd here a fleet of Sweeds-ships from Gottenbro, where they left Sir Cloudesly Shovell, the 9th instt, with about 70 sayl of ships under his convoy, he having 3 or 4 days before receiv'd orders from the King to joyn the Dutch Fleet, wch consisted of between 3 & 400 sayl, & were at Elsinure wth 8 or 9 frigatts, these ships say that Sir Cloudsly did imediatly send a leutent to hasten the Dutch to him, & they supposed that they joynd in 24 hours after their departure, the winds having been favourable, & continuing so, we hourly expect their arrivall, these ships tell me they did not see one privateer in their voyage.” 3 pages and 3 halves. 58. Petition of Francis Babe to the Lords Justices and General Governors of Ireland, for powers to examine witnesses in a charge made by him against Christopher Carleton, Esq., one of the Commissioners of Revenue and for the hearing of the matter to be deferred. Docquetted:—“Received Nov. 29, '94. 1 page. 59. Letter of Francis Babe to William Lowndes, Esq., at the Treasury Chamber, stating that in his former letter he gave an account of the many shifts and artifices used by the Comrs of Revenue, to prevail on the Lords Justices, not to give obedience to Her Majesty's letters in his case, and an account of their behaviour in setting the hearth money; acknowledging the favour done him in getting a second letter from the Lords, but he did not find the Queen or the Lords had that prevailing power there which they ought to have, but no fault could be laid to Lord Capel; stating further, that he was violently bated for endeavouring to do service to the Crown, and asking Mr. Lowndes to entreat Mr. Montague to hasten over the letters and papers relating to Mr. Carlton's trade. Dated Dublin, 1 Dec. 1694. 1½ pages. 60. “A memorial of the fees due unto their Maties servants, te King's heralds and pursuivants of arms, for their Majesties' coronation, with such other fees, as are constantly payd therewith, by privy seal.” Dated 3 Dec. 1694 on the docquet. With this memorandum on the back:—“It appears that a privy seale was passed 12th Janry 1686, for payment to ye heralds (amongst other things) of the like fees, with those menconed in this paper; excepting only 100li, wch they now insert for the Queen's coronation, being a soveraigne, & 40li for proclayming of the King & Queen joyntly.” Part of a page (quarto). 61. Petition of Humphry and Sarah Okeover, and others, to the Queen, showing that Francis Browne, a lunatic, had been in the hands of Dr. Adams at “Maribone,” for cure of his lunacy, above eight years without effect, and that Charles Maning who placed him there, enjoyed the said Browne's 100l. a year, and by sinister contract with Adams rather promoted his lunacy than endeavoured his cure, he being very ill-used by Dr. Adams; further showing that Mary Knight sister of the lunatic desired he might be committed to the petitioners, in order to his cure. Minuted:—“3rd Dec. '94. My Lords have nothing to do in this, but the petr may apply to my Lord Keeper. 1 page. 62. Representation by the Comrs for managing the duties upon vellum, parchment, and paper, to the Lords of the Treasury, requesting them to grant a general order, empowering them to issue warrants to the Receiver-General for payment of incident charges which he could not do by his patent, except they were allowed by their Lordships. Dated 4 Dec. 1694. 1 page (quarto). 63. 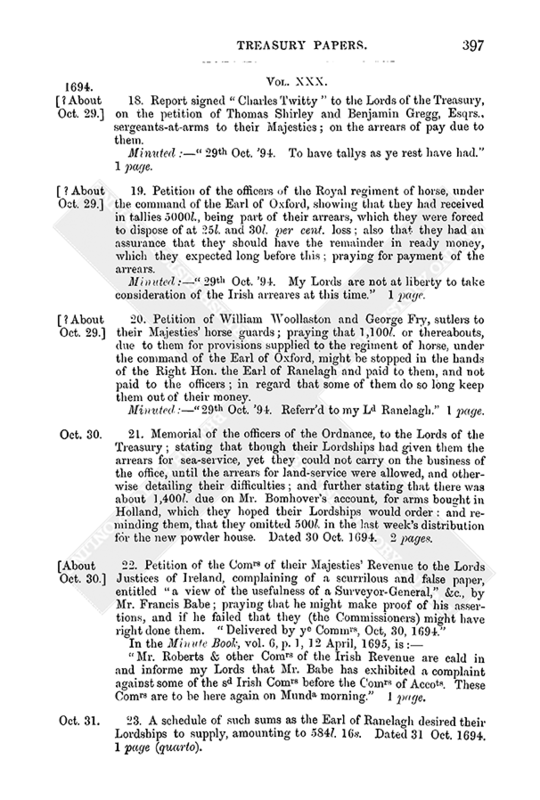 Report of Sir Richard Levinge, Knight, Solicitor-General for Ireland, to the Lords Justices and General Governors of Ireland, on the petition of William Fanshaw, Esq., and Charlotte Sarsfeild, a minor, only daughter and heiress of William Sarsfeild, late of Lucan Esq., deceased, as to certain estates in Ireland, formerly of Patrick Sarsfeild and William Sarsfeild, his son, whose daughter the petitioner was. Dated 5 Dec. 1694. Accompanied by the petition of Charlotte Sarsfeild, a petition to the King of Richd., Lord Colchester and Francis Sarsfield, of London, Esq., creditors of Patrick Sarsfield, late of Lucan, in the kingdom of Ireland, deceased, with report thereon (3 July 1694) three affidavits, a brief note, and a copy of a list containing particulars of the estate of William Sarsfeild. Dated 4 Aug. 1671. See other papers, Vol. XXXIII., No. 20, and Vol. XXXIV., No. 21. 17 pages and 3 halves. 64. 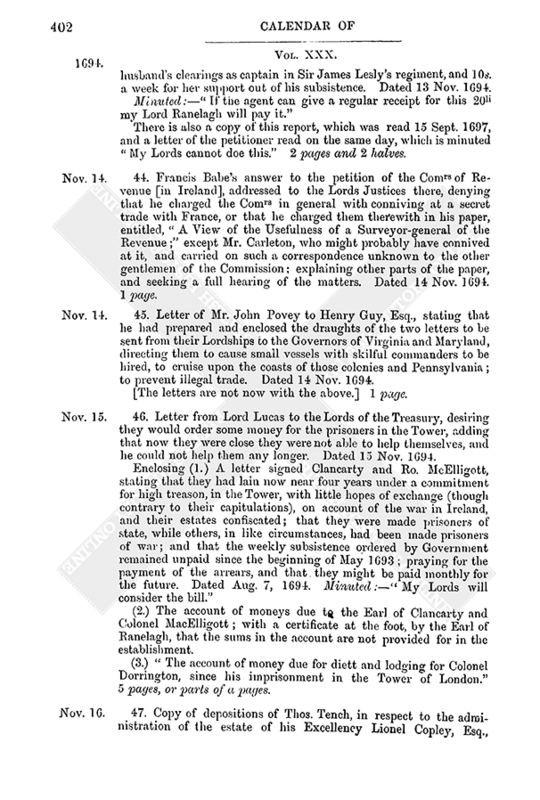 Petition of Christopher Carleton, Esq., to the Lords Justices and Chief Governors of Ireland, for a day to be appointed for the hearing of his defence against certain papers exhibited by Mr. Francis Babe, reflecting on him. Dated 5 Dec. 1694. 1 page. 65. “Paymaster Fox, his memorial for a warrant to pay 1,800l. to the Comrs of Transports, to be by them paid to Col. Ferguson for transport and provision of recruits shipped from Scotland to the Low Countries.” Dated 4 Dec. 1694. Letter signed W. Loundes on the same subject. Dated 7 Dec. 1694. 1½ pages. 66. Letter signed “Cha. Bertie” to the Lords of the Treasury reporting the various demands for the Ordnance office. Dated 7 Dec. 1694. 1 page (quarto). 67. Brief letter, signed Charles Bertie to the Lords of the Treasury, moving their Lordships for one year's patent fee due to Lord Abingdon, as Chief Justice in Eyre, on this side Trent, and for 100l. to reward discoverers of deer stealers. Dated 7 Dec. 1694. 1 page (quarto). 68. “Sir John Trenchard[s] letter to Lords of ye Treasury, to pay 55li for expresses sent by Consull Parker to Madrid; pd 28 Dec. '94.” Dated 7 Dec. 1694. Also the bill drawn on Sir John, indorsed, “This bill paid to Mr. Samuel Eyre by Mr. Guy out [of] secret service mo the 28 Decr. 1694.” 2 half pages (quarto). 69. Memorial of William Aglionby, Esq., late Envoy Extraordinary to the Duke of Savoy, addressed to the Lords of the Treasury, desiring to have a piece of silk, which cost him 3s. 6d. a yard, delivered custom free, he having bought it at Turin to make a field bed. Minuted:—“7 Dec. '94. The Lords cannot doe it, it being a breach of the Act of Navigation.” Part of a page (quarto). 70. Report of the Comrs of Customs to the Lords of the Treasury, touching 200 pieces of ordnance, containing about 250 tons, which the commissary to the Lords of the Admiralty upon the Maes prayed leave to export from hence to Holland, for the service of the States General of the United Provinces, without paying any custom; certifying that the customs would amount to 500l. and leaving it to their Lordships whether they would remit it. Dated 8 Dec. 1694. The memorial of the Commissary, an Order in Council referring it to the above Comrs, and copy of a report from the Ordnance office, signed “Romney,” on the same subject. Minuted:—“They must pay the duty.” 4½ pages. 71. Memorial of Col. Lillingston to the Lords of the Treasury, praying for money for his equipage, as commander-in-chief of the detachment then going to Jamaica; that the accounts of the subsistence might be made up; also for allowance for provisions for the men, when they served on board the ships of war. Minuted:—“For the K.” 1 page. 72. 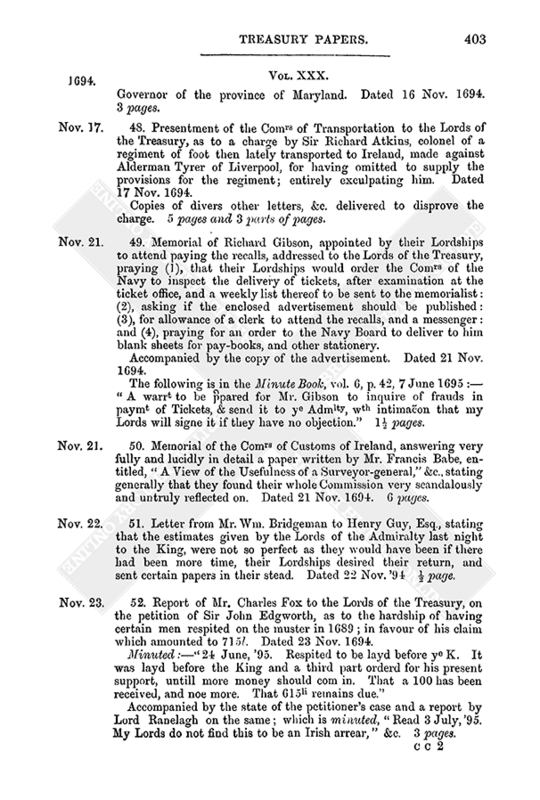 Report of the Comrs of Customs to the Lords of the Treasury, on the petition of Sir John Duddleston, of the city of Bristol, merchant, setting forth that there was due to him for the hire of ships employed in the reduction of Ireland, upwards of 6,000l., notwithstanding which he was threatened to be sued for 3,000l. due on his bonds to their Majesties for the duty upon tobacco; advising that it was equitable that process on the bonds should be forborne. Dated 10 Dec. 1694. Accompanied by the petition and two certificates. 2 pages and 2 halves.